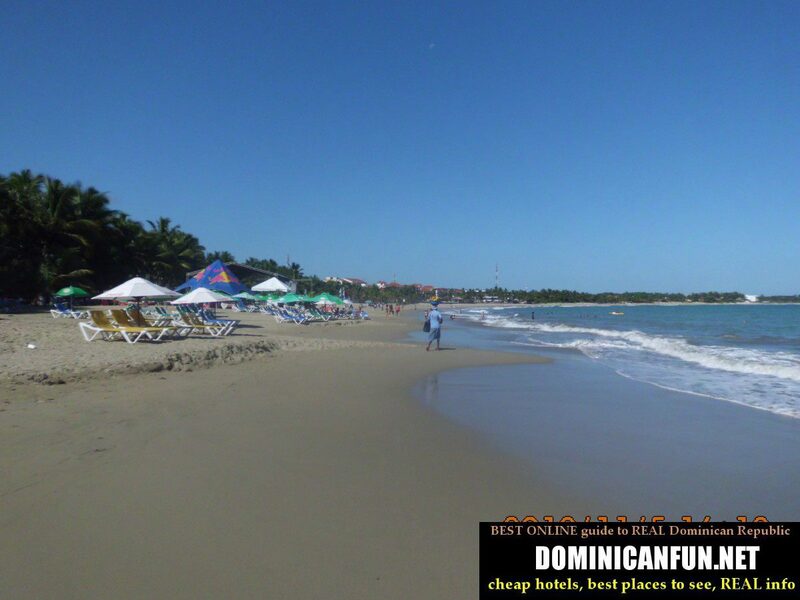 Cabarete is a town/ city located on the northern coast of Dominican Republic, just 15 km from other famous destination for the tourists on the northern coast - Sosua. Cabarete is also well known as "capital of windsurfing" in Dominican Republic - they say that it has the best combination of wind, ocean waves and ocean driffs. And that makes Cabarete the mekka of the surfers in DR.
Cabarete beach. You may spot on the second plan lady selling fruits - there are dozens vendors like her on Cabarete Beach. Windsurfers and other "watersport" lovers will find Cabarete amazing. Ideal conditions for such activities. There are also some young people from all over the world in here - so it may be a good place to meet new friends etc. Anyway - that makes also Cabarete very well communicated with the rest of DR and the other cities from northern coast of Dominican Republic. So if you dont have your own transport - you will always find gua gua, bus, taxi or motorcycle taxi that will take you to the place that you want. Oh...and...Road no 5. is in decent condition.